In my continuing effort to clarify the meaning of post-theism, I’m always looking for creative ways of making it not only understandable but relevant to our times. I happen to believe that more of us than we realize are post-theistic, in both orientation and practice, and that if this movement is to be accepted as a bona fide expression of healthy spirituality, we need to carefully distinguish it from other types and anti-types of religion. The diagram above presents several of what I regard as the most important distinctions that need to be made. 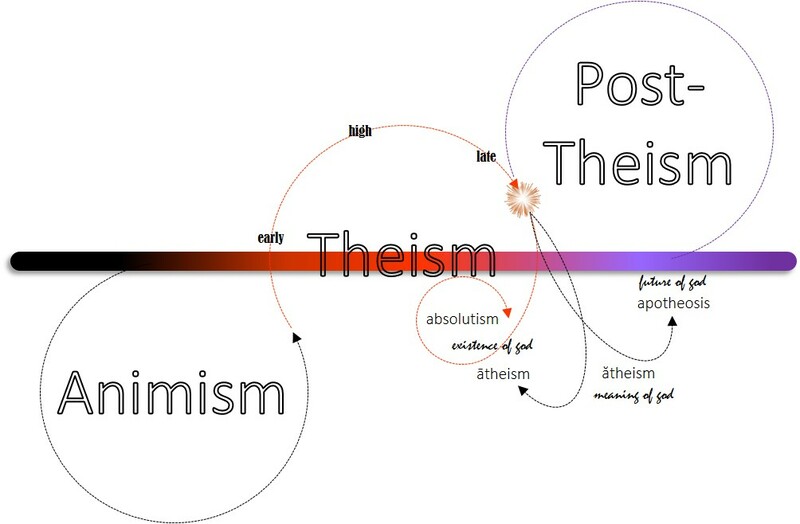 Three panels or lenses represent the crucial stages and transitions in the evolution of theism to post-theism, which I will follow in sequence. A frequent protest I encounter from nonbelievers or the religiously unaffiliated is that theism isn’t relevant to their experience. They don’t go to church or even believe in the existence of god, so my model is meaningless to them. But I don’t limit theism to its name-brand institutional varieties. Even Buddhism, which is conventionally characterized as a ‘non-religion’ since it doesn’t espouse belief in a separate deity, still orients its neophytes and practitioners on the ideal of the Amida (or “celestial”) Buddha whose grace and salvation can be summoned at death or in times of need. This devotional focus on an external model of providence, character, and virtue is central to my definition of theism. And that’s also the reason for my claim that every family system, regardless of culture or period in history, is a theistic system with taller powers who manage, provide for, discipline, and inspire underlings on their early path to maturity. In exchange for their respect and obedience, the taller powers offer protection, provision, comfort, and blessing. Admittedly, because families aren’t traditionally ad hoc volunteer organizations where members agree to a contract beforehand, this value-for-service exchange isn’t as formalized as it can be in institutional religion. But the societal model of higher (parental or taller) powers and devotees (children) is functionally identical. This also explains why, again across cultures, the deities of religion are imagined and addressed as mothers and fathers, with believers self-identifying as children and siblings, brothers and sisters in faith. I’ve placed key terms to label the three panels (or lenses) themselves, as well as the critical moves, transitions, or phases that track progress across them. Let’s begin with the panel on the left and see where the path leads. 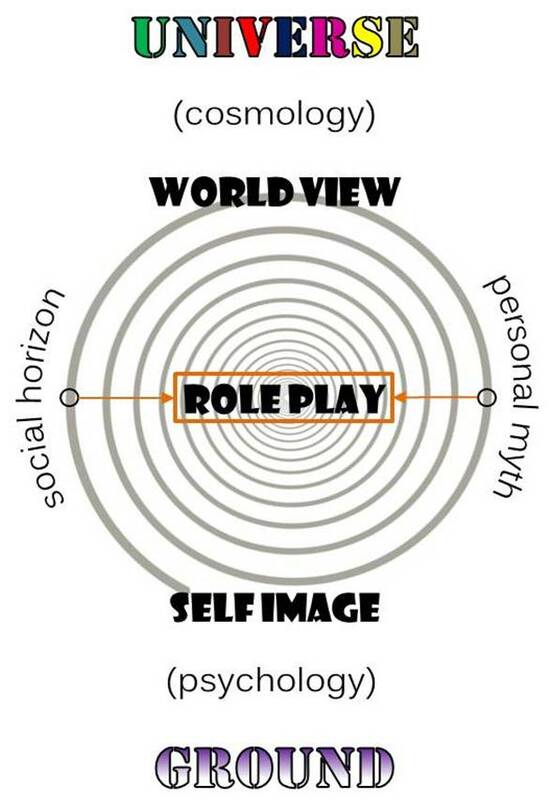 Theism (left panel or lens) identifies a devotee as one who honors and serves a deity, the principal role of whom is to provide what devotees need – e.g., security, solace, resources, intervention, revelation, final salvation – in exchange for their submission, worship, and obedience. Every theistic social system enforces a moral code based on Thou Shalts (symbolized by a carrot in my diagram) and Thou Shalt Nots (a stick). The purpose of this binary (either-or) morality is to draw clear boundaries separating desired behavior from merely acceptable, forgivable, and forbidden behavior in its members. The sun in my diagram symbolizes the higher power of the deity (or parent), while the figure below represents the devotee (or child). Throughout my blog I use the color codes of black, orange, and purple to stand for our animal nature (body), personal identity (ego), and higher self (soul), respectively. In this first panel, then, the morality of theism gets focused early on the project of shaping natural impulses and reflexes into behavior that is more in line with the shared interests of the tribe. 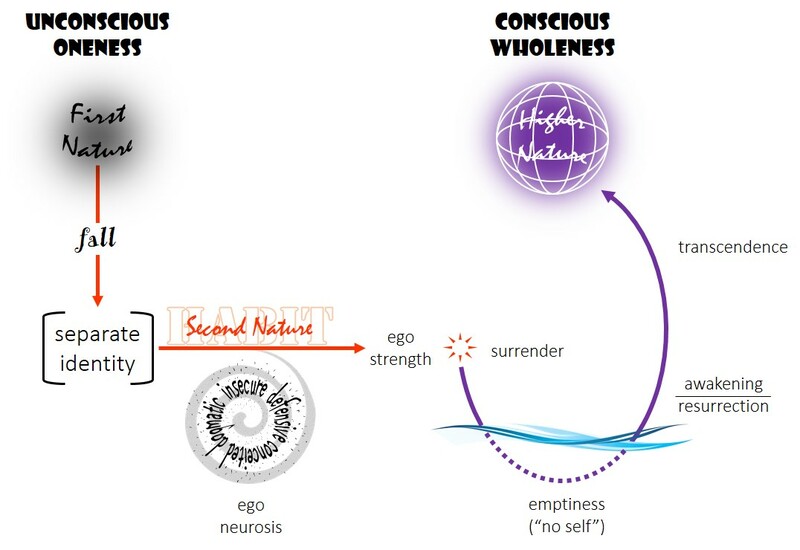 One of the first important achievements in this disciplinary process is to establish in the individual an executive center of self-conscious control (or ego) which will keep him or her in compliance with group norms. Besides providing for what a devotee needs, the deity also serves as an exemplar of character and moral virtue. It’s important to note that this divine exemplar has shape only in the storytelling imagination of his or her devotional community. Theological concepts, sacred artifacts, iconography, and elaborate architecture help to translate the narrative character of god into the communal experience and life-situation of believers – but no one has ever had a direct encounter with a deity outside the imaginarium of belief. In the recital and ritual performance of these sacred stories, the aspirations of devotees are focused on the virtues of god, who in this sense is an idealization or glorification of virtues for believers to imitate. To be good is to be like god. There are obviously many more details and nuances in every system, but this model of membership morality and devotional aspiration is the basic chassis of theism. As we sweep our gaze across the varieties of theistic religion today, the deities, stories, symbols and ritual ceremonies will be different, but this central frame is consistent throughout. In healthier forms of theism there comes a time when the devotee starts to suspect that the imaginarium of belief does not perfectly coincide with the realm of factual knowledge. Whereas the physical settings (churches, temples, mosques, etc.) and symbols of worship still provide a place where story and reality can fuse into one, a deeper extension of daily life into the factual realm increasingly exposes gaps and shortfalls in the once seamless veil of myth. Just as a child these days will eventually come to see that Santa Claus “isn’t real,” a devotee of theism will need to update his or her juvenile concept of god merely as a function of having a longer and wider experience of life. We shift, then, to panel two, initiated by a gradual or sudden disillusionment over what had been believed. At this point the individual might go in one of two directions: either to a position of altogether rejecting the earlier set, or to something else. The difference between these two options is reflected in the long (macron) and short (breve) vowel sound of the letter ‘a’. The macron over the ‘a’ in ātheism identifies this decision to deny and reject the existence of god as a matter of fact. An ātheist might be willing to leave the deity as a narrative character in myth, which now gets labeled as an untrue story, but a deity’s existence outside the story is categorically denied. Ātheists are the historical opponents of theists, and their disagreement is over the literal (rather than merely the literary) status of god. 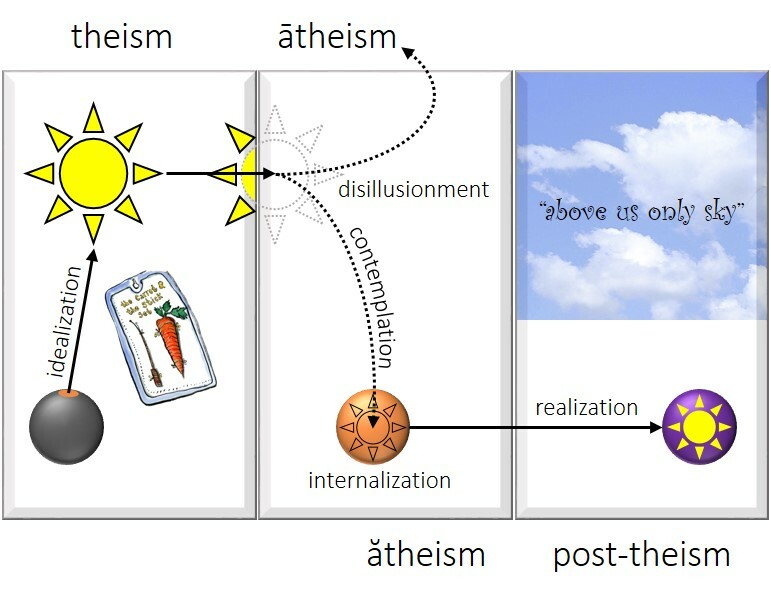 Another path out of disillusionment agrees with the ātheist on the matter of god’s literal existence, but follows a more contemplative investigation into god’s literary (i.e., metaphorical and representational) significance. I designate this position by a breve over the ‘a’ (the sound in apple): an ătheist, therefore, accepts the non-existence of god, even as he or she takes the symbol of god with renewed seriousness. It is possible, of course, for this symbol to carry a meaning quite apart from its correspondence to anything in the objective realm of facts. This is the special function of metaphors: to facilitate awareness across the threshold between fact and mystery, between what can be known and what can only be experienced. Going back to my earlier secular example, Santa Claus is not an actual person but rather a metaphor that connects us to the mystery of compassion, generosity, and goodwill. We can agree that Santa doesn’t exist, but nevertheless – or perhaps we should say, precisely because we are able to see through the myth of Santa Claus – the deeper significance of the metaphor can be appreciated. The contemplative take-away would be that we can individually become benefactors of altruism and charity in the world as well. Indeed, ‘Santa Claus’ can live in us. As a path through the disillusionment after theism, ătheism shifts away from the question of god’s existence in order to dig deeper into what the god-metaphor represents. Whereas the theism-ātheism debate gets hung up on whether or not the mythological deity corresponds to an actual metaphysical (or supernatural) being, the insight that it refers to nothing (or more technically, ‘no thing’) outside the myth but instead expresses something internal to the mystery of existence and becoming fully human, is crucial. Here we come back to the deity’s role as exemplar of the higher virtues that promote genuine community – which of course is a leap beyond merely managing social order: responsibility, altruism, love, cooperation, forgiveness, wisdom. This is not an exclusive set by any means, but it does trace out the trajectory of god’s character development in mythology. Over time, the deity becomes increasingly humane, which both registers the community’s ethical progress in this direction and inspires their ongoing advance into a fuller awakening. When theism directs the adoration of a devotee upon these higher virtues of the deity, a god-focused glorification activates a self-conscious aspiration to realize them in the devotee’s own life. Now, in place of a personified set of ethical virtues (i.e., the deity), these same ethical virtues come to infuse the personality of the devotee. The god is internalized, so to speak, and ătheism transitions into post-theism. Many today are lingering in a state of disorientation, just on the cusp of an ătheistic descent of contemplation while the higher virtues of human fulfillment and genuine community are just out of reach. Either they can’t get past the debate over god’s existence, or they can’t let go of god without feeling guilty and sacrilegious. For others, the carrot of heaven and the stick of hell don’t motivate anymore, but they value the fellowship and don’t want to lose it. In all cases they are stuck. It certainly doesn’t help that many forms of institutional theism these days persecute their own members who are waking up with new insights, real questions, and a much bigger vision. Whether you are a theist or an atheist, the amazing fact that the universe is so providently arranged as to support the ignition and evolution of life, to the point where you and I are here sharing this thought, ought to inspire wonder, gratitude, and praise. This is where religion began – at the confluence of astonishment and thanksgiving. Its role in human culture for millenniums has been to choreograph society by a system of sacred stories, symbols, and rites, with the purpose of fanning the embers of inspiration and uniting the community in worship. Really, it doesn’t matter whether you’re a theist or an atheist, because the rapture of wonder and gratitude of which I’m speaking is not invested in any claim regarding the existence of Someone behind and in charge of it all. The sacred stories, called myths after the Greek word for a narrative plot, did early on begin to tell of agencies with elemental and personified form who conspire to put on the Big Show. This wasn’t an effort to explain the universe, as later interpreters would mistakenly assume, but to confirm what we still today – theists and atheists alike – can acknowledge as the gratuitous intention at the heart of a cosmos that is our home. Our body is the evolutionary extension of matter into life and consciousness, not self-sufficient but outwardly oriented to the web of resources it requires to survive and prosper. This extroverted attention of the body engages with the sensory-physical reality around us, converting light waves into visual pictures, pressure waves into audible sounds, molecules into sensations of smell and taste, texture and weight (etc.) into how something feels in our hands. With an emergent intelligence capable of assembling all of this into an aesthetic unity of experience, our body serves as the perceptual vantage point in our contemplation of the universe. When we open our frame of attention to everything around us, the view we entertain, along with our understanding of its fit-and-flow design, is known as our cosmology. And whether we interpret it mythologically or mathematically, we are not merely questing after and entering into dialogue with a universe “out there.” As we are inextricably involved in what we observe, our contemplation is itself an act of the universe. That is to say, we are not only participants in the provident order of reality; we are manifestations of it as well. While the animal urgencies of the body naturally orient it outward to the resources it needs, a spiritual intuition conducts consciousness in an opposite direction, inward to its own grounding mystery. This aspect of ourselves is equally as primordial as our body, but its introverted orientation puts us in touch with reality prior to and beneath the threshold where it spreads out as the sensory-physical universe. The mystical-intuitive depth of our own existence is what is meant by “soul” (Greek psyche) – not some thing living inside our body, the “real me” trapped inside this mortal coil, but the deep interior of consciousness, the ground of being itself. Whereas the myriad qualities of the universe beyond us inspire a cosmology of appropriate complexity and sophistication, the ineffable nature of this grounding mystery within us actually quiets our attempts to describe it, calling us to mystical silence instead. In this way, the best religion will sponsor the research of its members in two directions simultaneously: outward into the most relevant and up-to-date cosmology, and inward to a mystically grounded psychology. The congruency of these two realms – outward and inward, body and soul, universe and ground – is portrayed in myth, revealed in symbols, and celebrated in sacred performance. Science and spirituality have always been the twin fascinations of religion, with its purpose taken up and fulfilled to the extent that it keeps us meaningfully engaged with the present mystery of reality. The frustration of religion’s essential purpose – this dialogue of body and soul, self and community, society and nature – was introduced long ago with the emergence of a competing ambition, too preoccupied with its own agenda and pressing needs to care as much for the big picture. Over time, ego’s self-involvement would come to command the focus of just about everything from religion to politics, commerce to lifestyle, philosophy to art. The archaic and long-standing function of religion in reconciling consciousness to the provident universe and its own grounding mystery underwent a profound change as its purpose got reassigned to individual salvation. 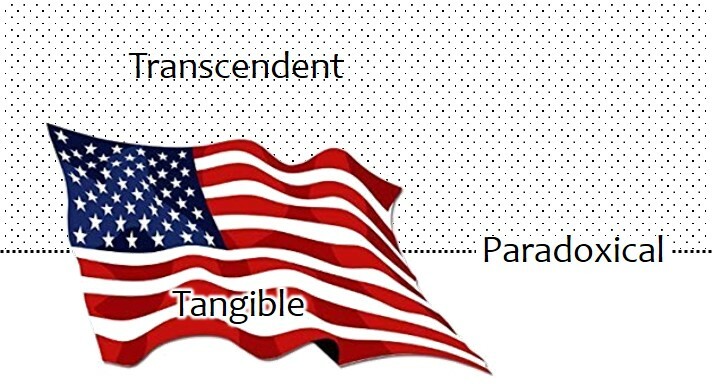 What we’re talking about here is the arrival and subsequent influence on culture of the personal ego – that opinionated, flamboyant, self-conscious, willful, ambitious, and deeply insecure center of identity called “I-myself.” Ego’s advent required a greater amount of social energy and attention, as its impulses were more likely to be misaligned with either the body’s instinct or the soul’s wisdom. A moral system of prohibitions, permissions, expectations, and responsibilities had to be created in order to keep its competing inclinations compatible with the general aims of tribal life. It’s a mistake to assume that ego just appeared out of nowhere. If we observe ego development in children today, or do our best to remember our own adventure into personal identity, we will understand that it really is a lengthy construction project where the tribe (through the agency of parents, guardians, instructors, and other “taller powers”) shapes the personality according to specific social roles. In this way, cultural definitions of the well-behaved child, the good student, the proper husband or wife, the commendable employee, the model citizen, and the true believer are “downloaded” into the operating program of personal identity. At first, the roles and associated rules need to be imposed on the young child and reinforced through consistent discipline. With maturity, however, the individual will self-consciously enter into numerous identity contracts with the tribe where rewards are not so immediate as gold stars or pats on the head, but may be sublimated, delayed, or even deferred to the next life. Eventually religion took on a role of its own as moral supervisor, mediator of atonement whereby sinners could be rehabilitated to good standing in the community, and keeper of the keys to whichever final destiny the ego deserved. All of this effectively pulled consciousness out of dialogue with the provident universe and its own grounding mystery, into a spiraling trance where the individual is bound to tribal orthodoxy, trading freedom now for security later, but also forfeiting the living communion of body and soul for ego’s final escape to divinity. Spiritual teachers like Siddhartha (the Buddha) and Jesus (the Christ) understood that deliverance from this trace of who you are is the true salvation.